It’s Friday, Beaconites! That means another week of real life Matthews meals. This week the Burke family weathered the storm, the Plague, and general exhaustion. So what did we eat? If you were watching closely, you might have noticed I did not use my whole chicken from last week. Never fear, I roasted it on Saturday, paired with sautéed broccoli and spaetzle (any other spaetzle lovers in the house? Tiny German dumplings, we serve ours with butter and black pepper, but they’re delicious with gravy. Publix carries the Maggi brand, my house favorite, though I dream of making it from scratch). My preferred chicken roasting method is to make a paste of olive oil, Italian seasoning, garlic, and onion and rub it over the chicken. Cover with tin foil and cook at 350 for 1.5 hours, then remove the foil and cook for an additional 30 minutes to crisp the skin. Sunday was cold and wet, and thanks to downed trees we were trapped in our neighborhood. It was a good day for Chicken Chili. I 100% cheated by using a McCormick seasoning packet (refer to the aforementioned plague), however, I have made this incredibly easy recipe in the past. Just right for warming our bellies on a gross weekend. I added some fresh bell peppers from the market to increase the nutritional value and flavor. Heat the oil in a large dutch oven. Add onions and carrots and cook for a few minutes until onions are clear and carrots have softened. Add garlic and cook a few minutes more. Dump in chicken and dried herbs, stir to combine. Add chicken broth and bring to a boil. 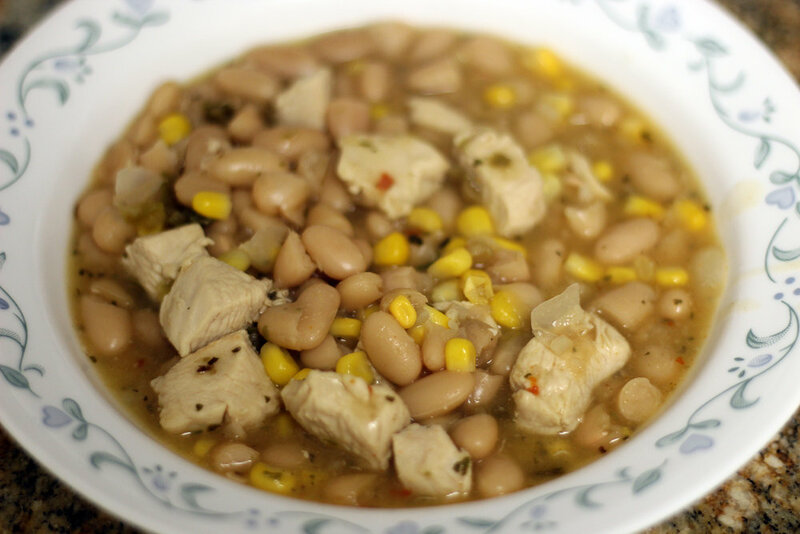 Turn down to simmer and let the flavors come together for as long as you have to leave it. 15 minutes before serving return to a boil and add egg noodles. Cook until noodles are soft, then serve hot with crusty bread. In the throes of the Plague, I ordered a pizza. Life happens. Still barely functional, I realized barbecue is the key to defeating the world’s worst cold, so we took away some sandwiches from Mac’s Speed Shop. Little known miracle cure. Homemade food again! 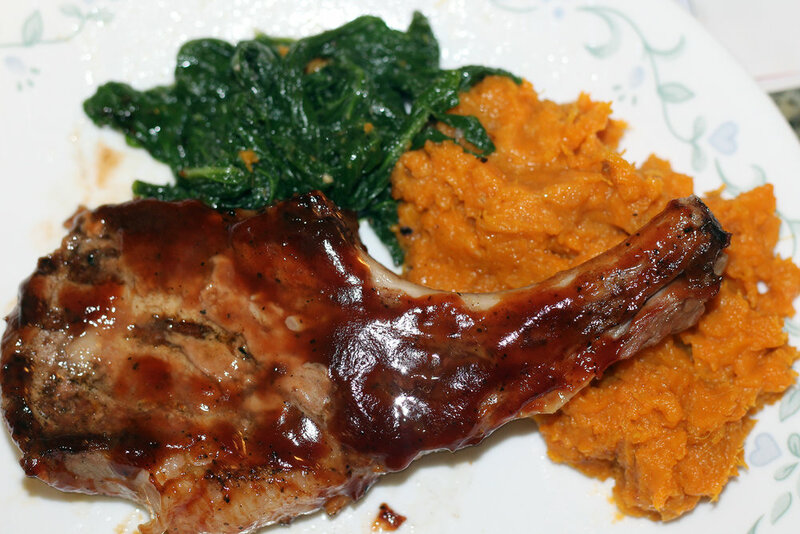 To celebrate my family’s renewed health, I made sweet potatoes, sautéed mustard greens, and grilled pork chops. A 100% Farmers’ Market supplied meal! And readers. The pork chops! We are not joking when we tell you fresh and local is better, because the taste difference is mind-blowing. I served my sautéed mustard greens on top of the sweet potatoes. The mix of sweet and spicy was delightful. More wet weather calls for something hearty. Looks like a job for beef stew and biscuits! Full disclosure: I love to cook. I would spend all day in the kitchen if I were free to do whatever I wanted. However, with my schedule, it’s virtually impossible on a weekday. So while I have experimented with many a beef stew recipe, most of them delicious, on a weeknight I return to a tried and true seasoning mix or packet that gives my family the benefit of homemade food, without the cost of my limited time. I’ll use a grocery store packet, or if we’re in a regular stew mood (September through March) I’ll keep a container of Rachel Cooks’ Beef Stew Seasoning ready made. That’s the week! I’ll be back at the winter market tomorrow, hoping for more root vegetables (yeah, root vegetables!) and hopefully more pork chops (all the pork chops! ).